A cultural festival like no other, the Adult Swim Festival will feature all things Adult Swim. Known for its unique brand of comedy and championing of emerging musical artists through their annual Singles program, Adult Swim fans will now be able to discover and experience those artists in person, dancing and laughing all weekend between two massive stages. In addition to the musical and comedy acts, fans will get access to a massive marketplace that will include interactive gaming, exclusive merchandise, local food vendors and more. The inaugural event does down October 6-7th in Downtown Los Angeles. 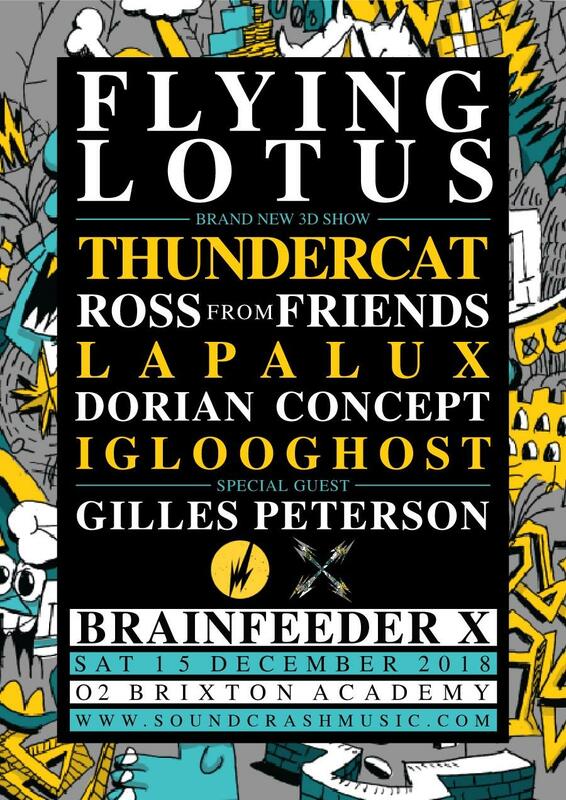 Soundcrash presents Brainfeeder w/ Flying Lotus and Thundercat. Brainfeeder has announced its takeover of London’s Brixton Academy on 15 December to celebrate the label’s 10th anniversary. The night, presented in collaboration with Soundcrash, is the endcap on a year which sees the imprint celebrating the legacy of its pioneering, far-out spirit via as-yet-unannounced signings, releases and memorable events. As is par for the course with this crew, they’ll be inviting some very special guests yet to be announced which rep the storied past, energetic present and cosmic future of the label.